With a view to provide income support to all small and marginal farmers under ’Pradhan Mantri Kisan Samman Nidhi’ (PMKSN) scheme, District Development Commissioner, Udhampur Ravinder Kumar today chaired a meeting of District Officers of different departments to review effective implementation of the scheme in the district. A detailed discussion were held on various aspects regarding uploading of beneficiaries data, activation of beneficiaries accounts, preparation of list of exclusive categories, collection of Data and organization of camps etc. 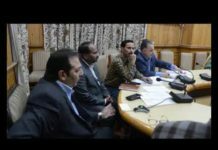 While addressing the media, the DDC said that the main objective of launching this scheme is to supplement the financial needs of the farmers in procuring various inputs to ensure proper crop health and appropriate yields. He said that the farmers who fall under this category up to 2 hectares shall be provided benefits of Rs-6000 per annum per family. DDC directed the officers of concerned departments to activate men and machinery and to expedite the process for effective implementation of this schemes at grass root level in the district so that the farmers can avail benefits of these scheme. In this regard he asked the officers to constitute a district as well as Sub -Division level monitoring committees to monitor all the activities. Besides this he instructed the officers to activate Zone level teams also. Additional District Development Commissioner, Ashok Kumar, Assistant Commissioner Development, Neelam Khajuria, District Information Officer, Er. Sajad Bashir Somberia, Chief Horticulture Officer, Brij Vallabh Gupta, besides other district officers and Zonal Head JK bank A.P Singh, cluster Head JK bank and representatives of other banks were present in the meeting.